Pro'sKit CP-336DI is a replacement die for crimping BNC connectors. 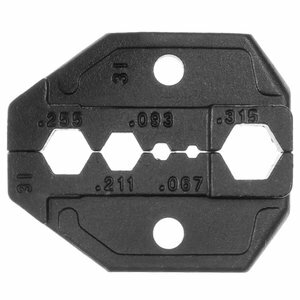 Crimper die is made of high-quality carbon steel. It is compatible with a wide range of Pro'sKit crimping tools. Pro'sKit 1PK-3003D1 Connectors: ring and fork insulated. Pro'sKit 1PK-3003D2 Connectors: non-insulated open barrel connectors (male, female). Pro'sKit 1PK-3003D4 Connectors: SMA & SFR. Wire cross section: optical fiber .095"
Pro'sKit 1PK-3003D10 Connectors: BNC-F. Cable type: RG 59,6. Wire cross section: .255", .320", .350"
Pro'sKit 1PK-3003D13 Connectors: DEC MMJ 6P2C/RJ11. Pro'sKit 1PK-3003D17-MA Connectors: shielded 8P8C/RJ48 Hirose-type. Pro'sKit 1PK-3003D21 Connectors: mini insulated ring and fork terminals. Pro'sKit 1PK-3003D36 Connectors: BLS, HU, PHU, MF contacts. Pro'sKit CP-236DC Connectors: non-insulated open barrel connectors (male, female). Pro'sKit CP-236DE Connectors: pin terminals (insulated, insulated double, non-insulated). Pro'sKit CP-236DM6 Connectors: Molex 8P8C/RJ45. Pro'sKit CP-236DN Connectors: ring and fork non-insulated. Pro'sKit CP-236DQ Connectors: short shielded 8P8C/RJ45 Hirose-type. Pro'sKit CP-236DQ1 Connectors: shielded 8P8C/RJ45 Hirose-type. Pro'sKit CP-236DR Connectors: ring and fork insulated. Pro'sKit CP-336DG Connectors: BNC. Cable type:: RG 58, 59, 62, 174, optical fiber. Wire cross section: 043", .068", .100", .137", .213", .255"
Pro'sKit CP-336DH1 Connectors: BNC-F. Cable type: RG 59, 6. Pro'sKit CP-336DI Connectors: BNC. Cable type: RG 58, 59, 6, 174. Wire cross section: .255", .213", .093", .068", 0.315"
Pro'sKit CP-336DK4 Connectors: BNC. Cable type: RG 58, 59, 6, 174. Wire cross section: .100", .128", .190", .213"
Pro'sKit CP-336DV Connectors: SMA, SMB, SMC & MCX. Wire cross section: .043", .069", .100", .128", .151", .213"